Boho Tassel Necklace. 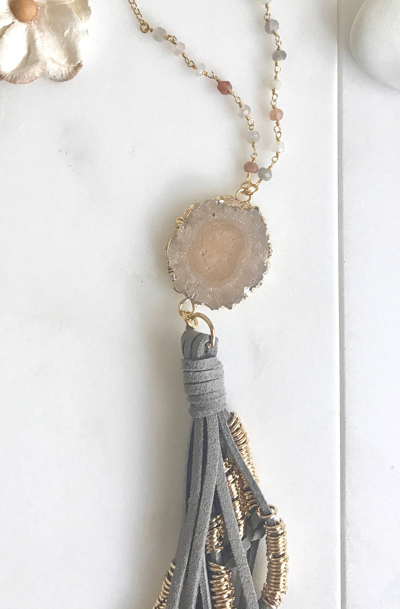 Grey and Moonstone Tassel Necklace. Long Peach Slice Tassel Necklace. Boho Jewelry. Unique Gift Idea. Fun, unique and one of a kind! The stone is about 1.25" long (NOTE - you may receive a slightly different stone as no two stones are the same, the rest of the necklace will be the same). The tassel is 10 inches long. Not for the faint of fashion! The chain is 30" long and is 14k gold filled.